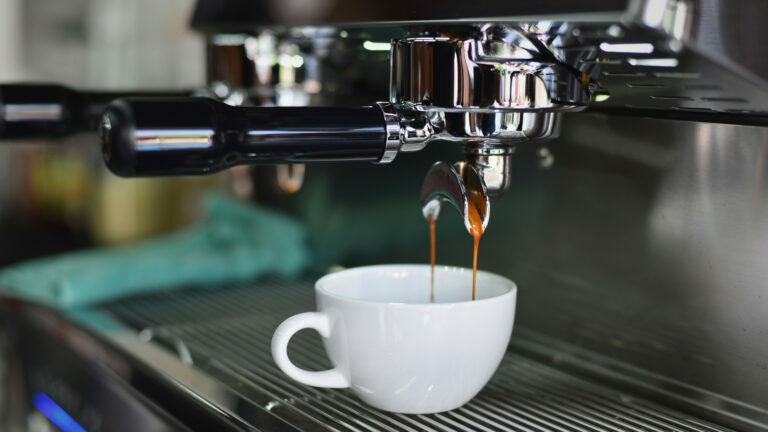 Before we get to the reviews, these are some answers to popular questions about espresso machines. We want to ensure that you’re getting the best advice and incredible information to make an informed decision. 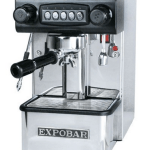 How long does a commercial espresso machine last? Are cheap espresso machines good? Why does espresso have such strong flavor? 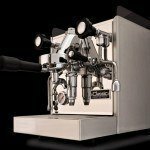 What is the best pressure for an espresso machine? Are you supposed to sip espresso? A commercial machine can last upwards of 15 years. It will depend on a few factors like maintenance. If you don’t maintain the machine properly, you can’t hope to get more than a year or two out of it. Maintenance consists of daily and monthly cleaning schedules. Daily, you’ll need to run the grouphead. Scrubbing the loose coffee from the machine is essential. There is an espresso machine cleaner that can remove oil that can build up in the machine due to the beans. Let it soak the machine while you clean the steam wand and filter. Make sure to rinse the detergent completely. You can do this by running the machine for 10 to 20 seconds. It’s best to do this a few times. Every few months, you’ll need to service the machine. This can be done by your employees quite easily. The flow rates and temp need to be checked to ensure they’re the right temperature and pressure. The switches should be tested, too. There are some great espresso machines that are not as expensive as others. Unfortunately, they won’t have the same features as a high-end machine. Many high-end machines often have a grinder attached. They can come with a tamper or frothing pitcher, too. With the cheap espresso machines, you’re not getting any of these extras. You’ll have to purchase them separately. 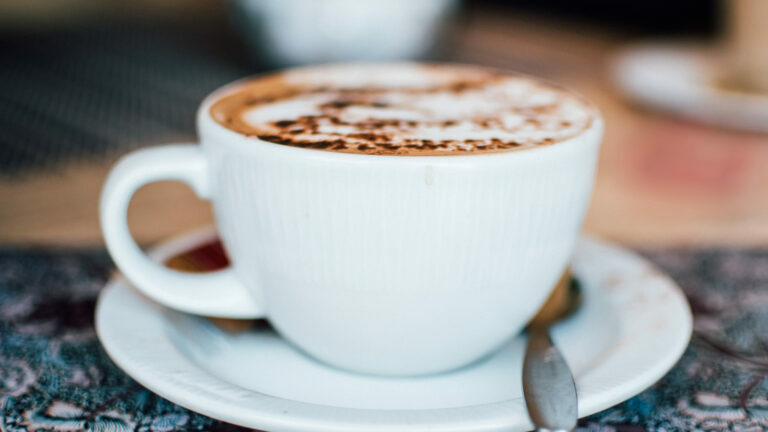 Can you put regular coffee in an espresso machine? If you plan on buying beans, you’ll want to grind them really fine. Espresso comes from grind that is fine and firmly packed. It’s not the same grind you’d use for drip coffee. When purchasing a grind, you’ll want to make sure it’s fine or says espresso on it. It’s not a particular kind of bean that matters. It should be labeled as espresso, though. 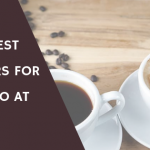 If you have a supplier, make sure that supplier knows what you want to serve your cafe customers. A 12-ounce drip brewed coffee has approximately 120 mg of caffeine. 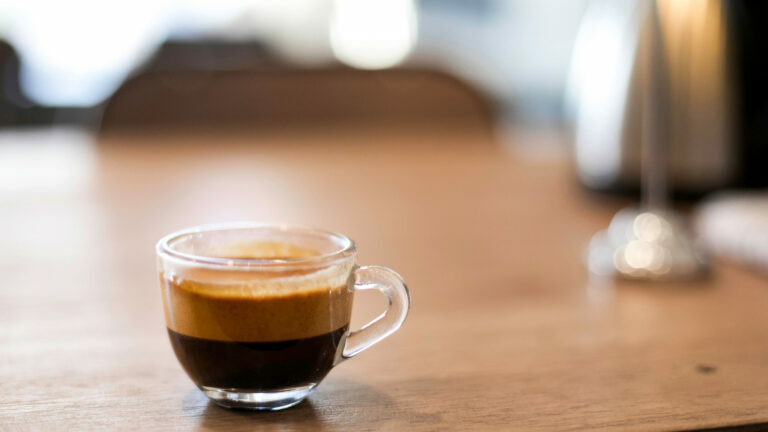 A 2-ounce shot of espresso has 80 mg of caffeine. If you compare them side by side, you’re getting more coffee and caffeine with a brewed cup of coffee. You’d have to consume so much to get it, though. 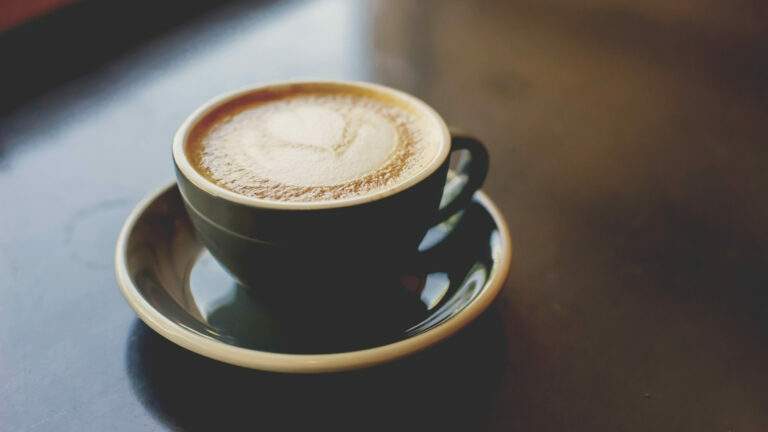 With espresso, you’re getting a more concentrated amount of caffeine in your 2 ounces. If you had a cup of espresso with 12 ounces like the brewed one, you’d have 480 mg of caffeine. First, it started with the roasting method. Many espressos are dark roasted. Dark roasted is the level of heat that the bean gets. It will become dark and strong flavored. The grind for espresso is very fine. It’s compacted with a tamper before the water is forced through it. The way the coffee is made gives a more concentrated flavor to the liquid. To get a proper espresso, the almost boiling water has to be forced through the grind. The barista will tamp it down and the machine forces the water. The best pressure is 9 BARs. Many commercial machines will list 15 to 17 BARs. To get a fast cup of coffee, the machine kick starts at 15 or 17. 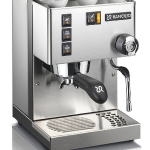 Once the espresso starts flowing, the espresso machine settles into the 9 BAR range. This video explains in more detail – especially the part about how over 17 BARs doesn’t mean you’re getting a better cup of espresso. Now, on to a question about the finer points of espresso etiquette. While the drink is called a “shot” of espresso, it’s not consumed like a shot of alcohol. Instead, the drink is sipped to be enjoyed. To truly enjoy your espresso, you can order and drink it like experienced drinkers. First, you’ll want to order an espresso from your local cafe. The barista might asked whether you want a single or double. A double will have a boost of caffeine. Next, you should sip some water. It cleanses your palette for the espresso. The foam on top of the espresso is called crema. It’s the result of the process of pulling the shot. It doesn’t taste all that great. Some people skim it off the top. You’ll want to stir your espresso. The flavors can separate slightly. To ensure it’s balanced, give it a quick stir. Lastly, take a small sip. Take note of the flavors you can taste. Once you swallow it, take a note of the aftertaste. As a commercial purchaser, you likely know how to drink your espresso. You can still help your customers with this advice. Not everyone knows how to drink an espresso properly. You can be the one that teaches them. 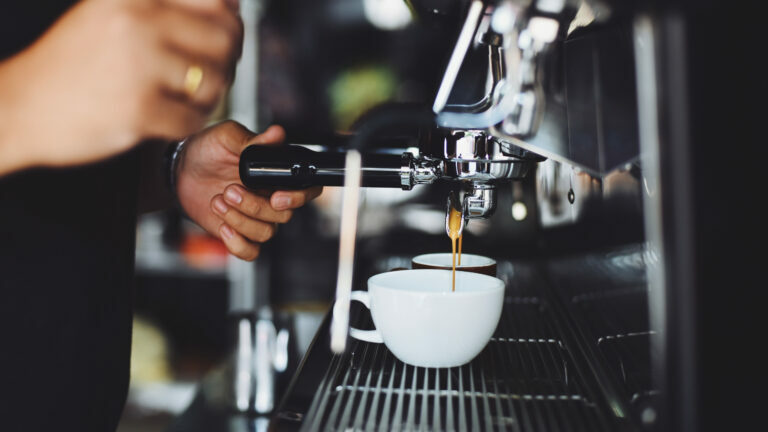 We have compiled reviews of the five best commercial espresso machines for 2019 that provide style, longevity, and value for your money as well as, of course, unbelievable espresso. 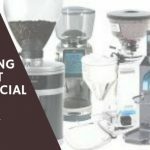 All of these machines we consider to be a good investment if you are the owner of a café, but many of these are priced for home use as well. These are in no particular order, and, according to our research, customers positively rave about each of these machines. 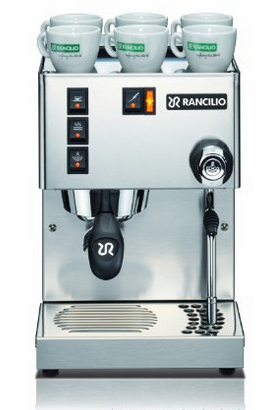 A serious espresso maker, for serious espresso lovers, at a serious price! This is a powerful machine even if it is only a single boiler. The steaming wand has been re-jigged so that it now moves in all directions. This makes seriously good espresso but comes with the warning that you ought to enjoy doing it, as this is quite a complex machine that requires some getting used to and lots of love. 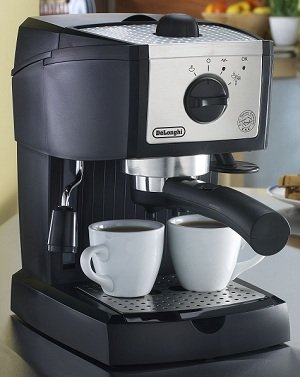 Its life expectancy is generally good and it may well be the only espresso machine you ever need! Can new baristas use this machine? 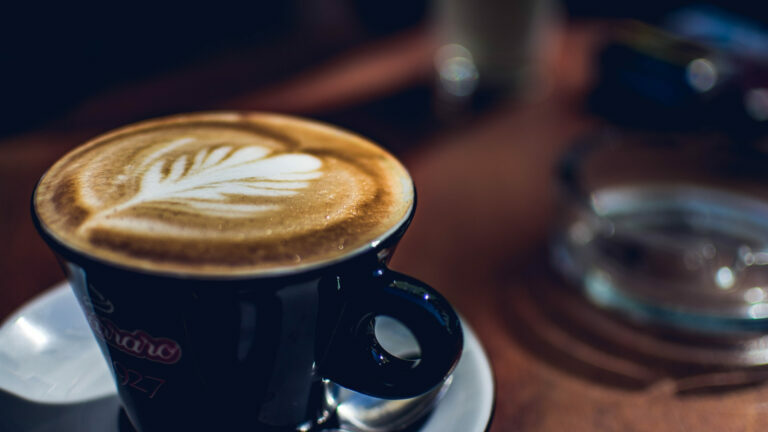 If you’re buying this for your commercial space, you’ll need experienced baristas. While you can certainly hire new baristas, but you’ll need some training in place. Baristas who are experienced will have to train the newcomers. This is something you want to consider before hiring your first baristas or waitresses in your cafe. They should know how to make their way around this type of commercial device. How big is the reservoir for this machine? The water tank size is 2 quarts. That’s a good amount of water for making dozens of espressos. You figure that each espresso is 2 ounces, you’re getting 32 espressos. That’s usually what you’ll see most mornings in your cafe or small coffee shop. How many bars of pressure? The pump will deliver 15 BARs of pressure for your espresso. As mentioned previously, you only need 9 for your espresso. The 15 BARs will force water through quickly at first. Then it’ll settle around the 9 BAR mark. Transform your poky kitchenette into a five star coffee house you say? Yeah, the Breville BES870XL can definitely manage that. Firmly on the pricier end, this has got everything you could wish for in one go. All singing all dancing swivelling wands, a large detachable water tank and it looks sensational. Also it is the only one on this list with a combined grinder so you can go straight for grinding beans to fresh espresso in literally minutes. The only thing it doesn’t have is a pod function, because that would be sort of beneath it, or something. 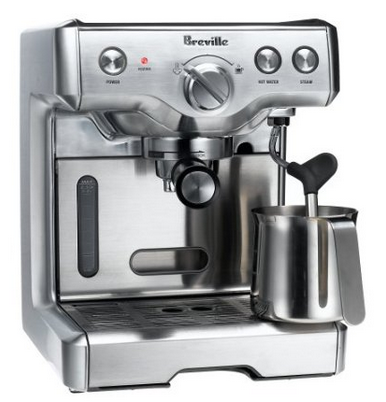 Breville are produced by an Australian manufacturer. They were founded in 1932. They make and sell other types of home appliances aside from espresso machines. The name was taken from Bill O’Brien and Harry Norville. They started by making mine detectors and radios for the war. After the war, they went to making televisions and small appliances. Eventually coming up with espresso machines. Okay so maybe that other one is a bit too big after all, or maybe you already have a grinder so don’t need one built in to your espresso maker. 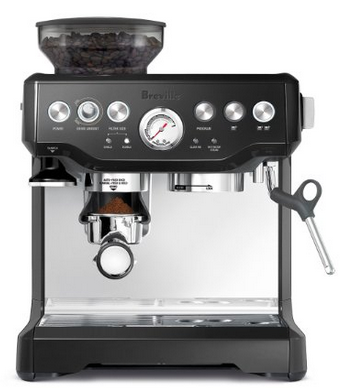 May we present the Breville BES870XL’s little sister the 800SXL. Smaller and cheaper but still every bit the consummate professional, this little minx whips up some excellent espressos and cracking crema, but you can also choose to cheat and use pods if you want to. How do you clean a Breville espresso machine? Most espresso machines are cleaned using the same method. We covered that in previous questions. In the case of Breville as well as others, you’ll want to decalcify once a month. Water can leave calcification behind. That mineral build up has to be cleaned regularly. The easiest way to remove the minerals is to clean with white vinegar and water. The steam wand and group head should be soaked. If you want Italian espresso without going to Italy, look no further. Middle ranging in price but high ranging in quality, Gaggia are a mark of excellence in the arena of espresso. This is a smaller espresso maker that still adheres to a professional quality and has the added advantage of being able to pull two shots of espresso in one go. She also heats up nice and quick, which is what you want when you are in a hurry in the morning. Gaggia is owned by the Saeco International Group. Both companies were purchased by Philips in 2009. 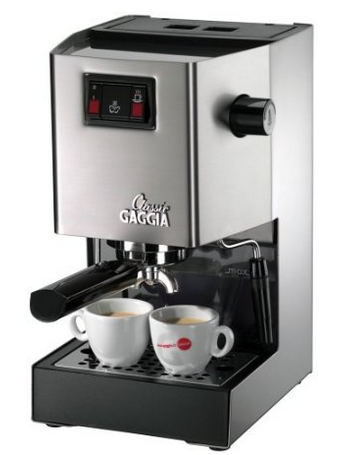 The Gaggia is an Italian company that makes all kinds of coffee machines. They have regular coffee machines, cappuccino, and espresso. Is Gaggia a good brand? They’re a well-known brand that makes some of the best machines in the world. Since espresso started in Italy, it makes sense that some of the best machines are produced there, too. An espresso maker for under $100? Yes it can be done and done well too, just ask makers De’Longhi. This little treasure really gives you all you need and fast –taking a mere thirty seconds from initiation to espresso blast off. That is a result as far as we are concerned! Powerful, quick and easy to use – there’s very little to fault with this machine and yes, you can use pods with her! How to clean a De’loghi? You’ll need to change the filter in your machine regularly. Remove the filter cap by unscrewing it. You can push the filter out and remove the gasket. The holder can be cleaned with soapy water and a scrub brush. Rinse completely and allow them all to dry thoroughly. The boiler can be removed for cleaning, too. Is this a good espresso machine even though it’s less expensive? The brand is well-known for quality machines. They have more than a few around this price point on the market. Many of the machines are on the best lists for the year because they’re incredibly well made. They have features like consistent temps and thermostat for steaming. These are some of the best commercial espresso machines on the market. There’s a machine for every budget. Consider how many espressos you plan on making as well as the skills of your employees when choosing a machine. These are home machines. Commercial not even close. Well, it depends on your definition of “commercial”. I think these would do well in a small café or restaurant, depending on how busy it gets. In fact, I’ve seen these machines in “commercial” environments before. Even in some restaurants, espresso isn’t getting ordered every 10 seconds like a Starbucks, so one of these machines would be fine. 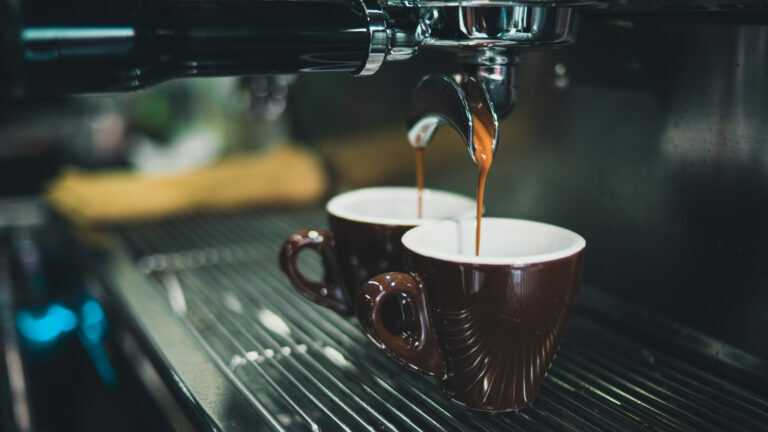 It really depends on the circumstances, and obviously if you’re buying a commercial espresso machine, you need to think about how much espresso you’ll be needing at any given time. For instance, you don’t want to buy something for $10 000 if you don’t need one, right? Maybe you need a $5 K machine, maybe $2 K. It’s the same with grinders. Some businesses need to know how fast their commercial grinder can grind for the customers that are coming through, and that’s another consideration that is relevant here.